Experience Peace in His Presence. The beloved #1 bestselling devotional Jesus Calling ® is now available in a morning and evening edition, allowing you to meditate on the hope and peace of Jesus throughout each day and as the evening draws to a close. 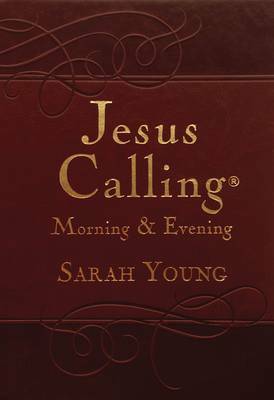 Each morning entry is from Jesus Calling ®, and each evening includes powerful and poignant excerpts from Sarah's bestselling books , written-out Scriptures, and a guided thought for you to focus on just before you turn out the light. Based on Scripture and written as if Jesus Himself is speaking directly to you-words of encouragement, comfort, and reassurance of his unending love-you will find peace even in the midst of busy days. Begin and end each day in the presence of the Savior who is always with you and loves you forever.